A sobering thought as we enter 2019–most Fortune 1000 executives don’t have confidence in their company’s ability to respond well to disruption or change. APCO Worldwide’s research of 527 of these executives lead it to join forces with three other PR consultancies to help companies become more agile. They believe agile and curious firms are better able to respond to change. Just prior to PR News’ Healthcare Social Media Summit in Baltimore, PR News and partner Crisp held a Communications Leadership Roundtable that explored integration, investment choices and best practices for getting staff to embrace digital communications, among other topics. How do you tie what you measure with business objectives? That’s the questions we asked of five senior communicators for this month’s Roundtable. For years we composed a decidedly sad picture of PR measurement as Measurement Month arrived. For many PR pros, measurement was an albatross. 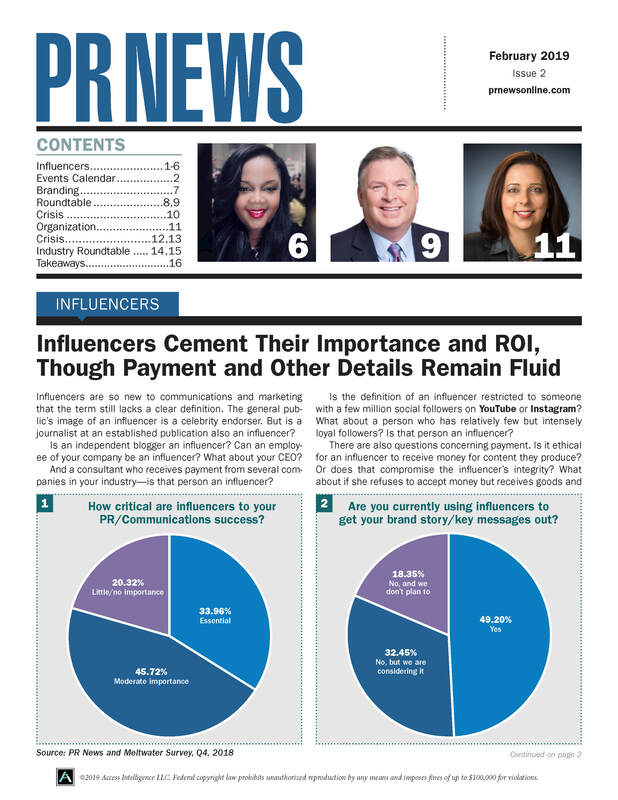 The tide seems to be turning, with communicators insisting on high-quality measurement that yields insights, according to a new survey from PR News and PublicRelay.